A Weezer/’80s hits crossover. Sweet dreams really are made of this. Recently on “Saturday Night Live” was a sketch starring Leslie Jones and Matt Damon. The two portrayed Weezer fans, but one was a self-proclaimed purist (a fan of the older albums like the “Blue Album” and “Pinkerton”), the other a “real” fan (a fan of all the band’s music, including its contentious recent releases). 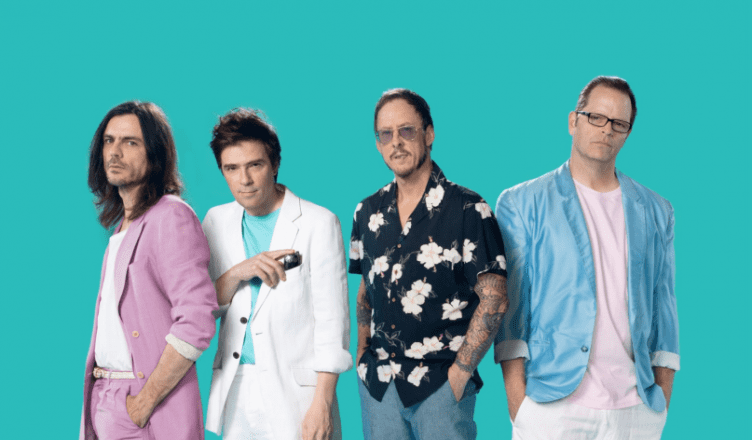 As embodiments of the two halves of Weezer’s current fanbase, how would either character feel about the band’s latest self-titled release, also known as the “Teal Album”? Dropped online without warning on Jan. 23, the “Teal Album” is a cover album of 10 hit songs primarily from the ’80s. It features a good selection of songs, such as “Billie Jean,” “Everybody Wants to Rule the World,” “Take On Me,” and “Sweet Dreams (Are Made Of This).” But why covers? It all started with Twitter account @weezerafrica launching a campaign in Dec. 2017 for the band to cover Toto’s “Africa.” Weezer, with its proclivity to be involved in the internet’s memes (just look at its music video for “Pork and Beans”), responded in May 2018. If you’ve listened to the radio or sat in a dining hall recently, you’ve probably heard Weezer’s cover of “Africa.” Listening to it can be startling at first, but you may realize that it’s strangely not that bad. The “Teal Album” goes a step further to make you admit, “Hey, this is actually pretty good” — as far as covers for famous songs go, at least. The names of the songs on the tracklist are enough to make anyone wonder how Weezer sounds covering songs like TLC’s “No Scrubs” and hit “play” out of sheer curiosity. The answer is, surprisingly well. There’s something for everyone. For the Weezer purist, the appearance of crunchy electric guitars and heavy drum beats is very much welcome. For the “real” fan, these songs are much like the band’s goofy, poppy style of recent albums. For the unacquainted, it’s half an hour of some serviceable covers of well-known songs. Admittedly, there’s little reason to listen to these songs over the originals other than the fact that they’re covered by Weezer, which could either be a selling point or a deterrent for the public. No, the covers don’t meet, never mind surpass, the originals, and they don’t offer any real creative spin to them. The effect is a watered-down, cleaned-up version of the original songs that, save for your personal favorites, you ultimately can’t relisten to more than a few times. But they’re more than competent enough and ultimately a harmless listen. Still, the album’s silly yet respectable vibe makes it so that it sounds like a professional version of a group of friends singing in the car. And unlike the band’s previous releases, which lean a little too hard on the crutch of their pop influences, the “Teal Album” actually feels refreshing to listen to. With its synth keyboards and groovy guitar riffs, the “Teal Album” is genuinely fun even though it’s nothing technically new. To some extent, it may be a cash grab or a marketing move to build anticipation for the band’s long-awaited “Black Album,” out March 1, but nonetheless, the “Teal Album” is a surprisingly welcome addition to the band’s discography. While critiques of Weezer straying from its roots remain reasonable, it’s frankly admirable watching a band— one that for the last several years has become a punching bag for critics and older fans— disregard the notion of maintaining a preconceived image that would meet its fans’ expectations. Weezer’s comeback may still be in the works, but listening to Weezer jam to Ben E. King’s “Stand By Me” makes the wait a little more enjoyable.